We're hooked. Mobile phones and related online services are the "cigarette of this century". Each morning, we check email before greeting our loved ones. Our phones, apps and sites have become an extension of our bodies and our lives. From Facebook to Pinterest to Candy Crush, some tech companies have learned the secret to creating habit forming products and used this knowledge to achieve incredible customer growth with minimal marketing spend. Hooked: How to build habit forming products is a new book by Nir Eyal describing a simple methodology to tap into people's psychological needs, then create a behavioural/experience cycle to connect a user's problem to your solution. The more loops of the cycle, the stronger the habit. The author also presents a framework for assessing when this is morally acceptable and when it should be avoided. It's not only for startups seeking to become the next Flappy Bird or WhatsApp. These ideas apply equally to enterprise innovators. All sorts of businesses from banks to retailers to accountants should be taking note and thinking about how behaviour design can help them to increase customer lifetime value, achieve price flexibility, accelerate growth and increase defensibility of their offerings. Triggers can be external or internal. External triggers include advertising, emails, phone notifications, word of mouth, PR, social sharing, website buttons or any other external experience inviting a user to take action. These triggers are the subject of "growth hacking" and are crucial to initiate and incubate a user habit. However, the real magic happens if we can tap into internal triggers. This is when a user is motivated by an internal emotion or feeling then chooses to behave in a way that you have intended. This creates a deeper, stronger compulsion to use your service and allows you to solve the user's pain immediately when they feel that pain. When designing these behaviours, you'll need to dig deep to understand exactly what emotional need your product is solving. This may require you to ask "why" again and again until you get to the bottom of their need. For example, on first impressions a user may tell us they check our email to make sure they haven't missed anything. Dig more deeply and you may find the motive is an inner craving to be needed by others. 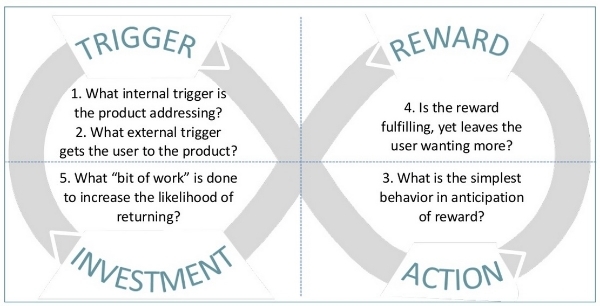 Once we understand the internal triggers that can power our user habits, the following sections of the book tell us how to activate these habits via action, reward and investment. Explore your product's trigger potential.. Does your product have the potential to hook users? Think about what core emotional needs users feel right before using your product. These could be your internal triggers. Think about how you could create external triggers that coincide as closely as possible to the core need/pain your product solves. To capitalise on a trigger we design the simplest possible action in anticipation of a reward. 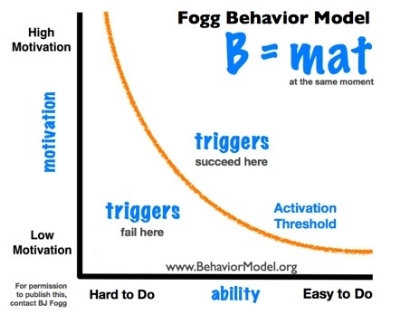 In this section, the author builds upon the Fogg Model of behaviour which says that behaviour equals Motivation, multiplied by Ability, multiplied by a Trigger (B=MAT). Fogg has a great expression to summarise this: "Habits form when we place hot triggers in the path of motivated users". Fogg Behavioural Model by B.J. Fogg. Users are motivated by the value in the reward they will receive for taking this first, simple action. Core motivations relate to seeking pleasure, avoiding pain, seeking hope, avoiding fear, seeking acceptance or avoiding rejection. Ability is about making the desired action as simple as possible. A user is more able to complete an action when we minimise their investment of time, money, physical effort, brain cycles, social deviance or breaking from routine. The book also teaches us how to be aware of the cognitive biases that distort a user's perceptions of motivation and ability. For example scarcity increases perceived value while price anchoring can influence our perception of value relative to a reference point. Explore your product's key actions..
What is the simplest step your user can take before they are rewarded and have their "itch scratched"? How much are you asking of them in terms of time, money, physical effort, brain cycles, social deviance and break from their routine? Can you simplify? Once a user has taken their first action, they are on the hook, but the relationship is tenuous. In the subsequent sections the author teaches us how to deepen and strengthen the relationship though reward and investment and fuel further cycles of the hook model. The idea of "gamification", harnessing user engagement concepts employed in video games, has been used (and abused) in tech circles for some time now. However in the context of the hook model, you can extract a few simple principles to separate the psychology from the hype. The key to supercharging these desires is to maintain a sense of uncertainty. When there is an element of variability in the reward, the strength of anticipation is greatly increased. Nir places these rewards into three categories. "Rewards of the tribe" are about our need to form connections - our longing for attention, appreciation, to be needed, to compete, to connect. "Rewards of the hunt" tap into our primal need to search for resources. These are the rewards we encounter in ecommerce, online gambling and the infinite scroll of Pinterest. "Rewards of the self" are about self-achievement and the desire to achieve mastery and completion when we "level up" or empty our inbox. Beware of shallow, predictable rewards since they won't have the desired effect. You need to directly addresses the internal pains you've discovered in step 1 above to create lasting habits. This explains why many artificial attempts at gamification fail. You also need to leave the user with an sense of autonomy and surprise to create habits that stick. Explore how your product scratches the itch..
Do you clearly understand what core need or pain your product solves? Do you provide a reward which is variable and directly solves that pain? Do you leave your user hungry for more? Now, you have achieved a sufficient level of engagement to ask your users to invest effort in your product. In fact, unlike step one above, more demanding user actions may actually have greater habit-forming potential at this stage in the cycle. As users "store value" in your product, it becomes more sticky. They could invest by creating content (Instagram) data (Salesforce), followers, (Twitter) or reputation (Freelancer). Additionally, people have a bias to excessively value their own work and to be consistent with their own past behaviours. All this means that the more they invest of themselves in your products, the stronger their habit will become. The investment step is also an important time to "load the next trigger". This means that their action will lay the ground for a future external trigger which will bring them back to your product. For example in Facebook, when a user uploads a photo, it will probably be "liked" by friends, generating notifications (external triggers) to bring the user back to Facebook. Thus, the habit-forming cycle repeats and deepens. Explore how your user invests in your product..
How do your users invest themselves in your product? Content? Data? Followers? Reputation? Are you missing opportunities to "load the next trigger" and bring them back for more? "Triggers", "habits", "cigarettes". Are you feeling uneasy yet? We're all aware that online addictions can have negative and sometimes devastating side effects. How do we decide when it is OK to harness behavioural design for our business benefit? Nir Eyal encourages you to go out and find problems in the world that need to be solved and use these techniques to maximise the positive impact you can have. What does this mean for enterprise? Innovation, tech and product teams who have already been engrossed in "a day in the life" of their customer and use modern experience design techniques will instantly appreciate this book. The habit canvas is a great new tool for any experience designer or product manager and is particularly useful when thinking about how to activate internal triggers. It's most suited to products which are used frequently enough for habits to be formed. Even if your product isn't used frequently today, with some lateral thinking you could come up with entirely new, beneficial user experiences to deepen the connection between your business and your customers. What do you think about this approach? Please comment!